Flat Stanley first came into our lives a couple years ago when a friend asked if his Flat Stanley could visit us for awhile. 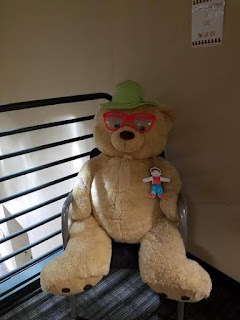 We've since had another Flat Stanley visit. He's great company. He isn't a picky eater and he easily fits in a book or my purse for traveling purposes. He's quiet and clean and always wears a smile on his face. 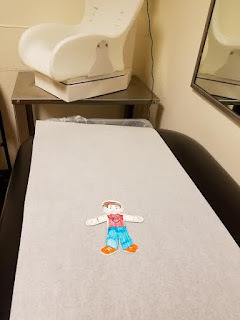 I hadn't heard of Flat Stanley before he first came to visit us, a boy who was flattened by a chalkboard and never filled out again, or so the story goes. When we took him to Disneyland one year, the cast members at the Park knew just who he was--he is famous! The character Flat Stanley is evidently a phenomenon of sorts. 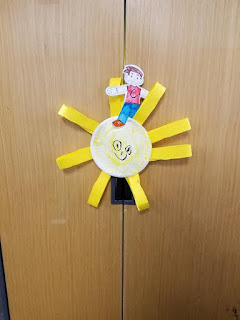 Children can put together their own Flat Stanley and take him on adventures or mail him to a friend to explore the world. 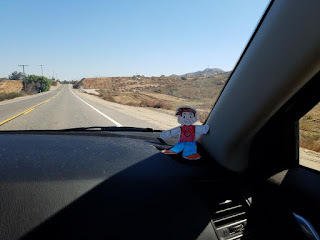 I love the idea and have had a lot of fun posing Flat Stanley in various locations. Admittedly, Mouse's interest in the paper figure has lessened over time, but she seems to enjoy the books. From what I've heard, there is also a Girl Scout version out there that we may have to give a try. 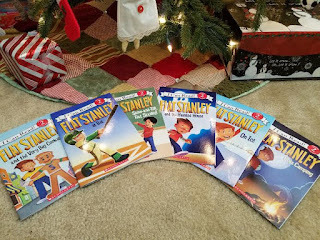 Mouse received the above six titles for Christmas this past year to help her with her reading. The stories are cute. Flat Stanley and his brother find themselves in all sorts of predicaments, whether it be as they are helping the local baker, scaring a bully, struggling with self-image issues, or what have you. 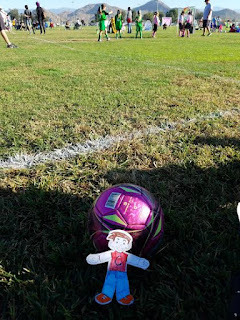 Flat Stanley is often the one who saves the day, his flatness coming in handy. Mouse and I or her dad (or her grandmother) have been reading the books together. The stories certainly hold Mouse's attention, and she likes to see how Flat Stanley solves each of the problems he encounters. To learn more about author Jeff Brown and his work, please visit the author's website. To learn more about illustrator Macky Pamintuan and his work, please visit his Facebook Page. I haven't read Flat Stanley in YEARS! I remember sending him to my aunt when I was a little girl... in third grade. So yeah, a long time ago. I may have to think about how I could incorporate him into our classroom. Thanks for sharing and bringing back some fun memories! My kids did Flat Stanley projects in 2nd grade and it was always a lot of fun! I'm glad Mouse is enjoying the books! We've had people send us Flat Stanleys to take pictures with before but Vance never experienced him. The books look like fun! 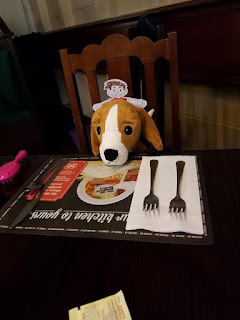 Kathy - I need to send back the Flat Stanley we have with us now. His owners are probably wondering where he is! Jenclair - Yes, it's a neat idea, isn't it? A way to make the books--in particular the character--more interactive. Athira - I think Shreya would enjoy them. Maybe she will have her own version of Flat Stanley. I hear there is a Girl Scout one and I think it'd be fun to get Mouse one of those. Melody - I agree. It's such a neat idea. It's definitely a way to for children to interact with a book (or character) in a way they don't normally do so. Flat Stanley! My daughter had to send a one of these to someone far away and get pictures of it for a class project. Thank goodness my sister had in-laws in Alaska because I didn't know anyone to help us out. I hope your daughter enjoys these books as much as mine did. Carole - That is so fun. I bet the kids had such fun doing that. I think this is such a cool idea and to get kids engaged and excited. Sounds like Mouse is having a lot of fun with these stories. We haven't tried these but I need some new material! Stacy - I think my favorite part is being ale to send around Stanley. The books are cute, but that extra interactive piece makes it even more fun.